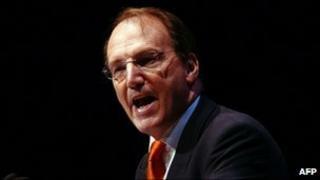 All schools in England should have university scholarships for their poorest pupils, the deputy Liberal Democrat leader Simon Hughes has said. Linking scholarships to schools and colleges - rather than universities - would motivate children, he said. And this would end the situation where some schools sent no pupils to university. This was one of 30 recommendations made by Mr Hughes in his final report as champion of university access. He was asked to help promote higher education to poor pupils after MPs voted in December to raise tuition fees in England. Mr Hughes was one of eight Liberal Democrat MPs to abstain, or be absent, in the vote on fees, while 28 Lib Dems voted for the changes and 21 voted against. He had been among those warning that poorer pupils could be put off from applying to university by the trebling of the cap on tuition fees. From 2012, universities in England will be able to charge up to £9,000 a year for undergraduate courses. Mr Hughes says his most important suggestion is that scholarships are offered through schools. Under the planned National Scholarship Programme, starting in 2012, students from poorer homes (with an income of less than £25,000 a year) will be eligible for annual awards of about £3,000 - and the current plan is for these to be allocated through universities. Mr Hughes said poor youngsters should be told about the scholarships at 15 and would then apply for the funding - and university - a year or two later. Mr Hughes told BBC Radio 4's Today programme that there was "enough money in the kitty" for each sixth form and FE college in England to offer three scholarships in the first year of the programme. He said that while some schools sent many young people to university, others had "no tradition of sending anybody to university". He also said he wanted to end the use of the "old language" of "fees and costs and loans". Instead, potential students should be told of the "costs and benefits" of going to university, and the details of the tuition fee loans scheme explained. At a press conference launching his report, Mr Hughes said the next six months would be "crucial" in terms of preventing the rise in fees from putting off poorer students. "Fighting a battle of last year in the next six months will not be helpful. "Otherwise youngsters in flats in Old Kent Road (in Mr Hughes' south London constituency) will still be put off." Other recommendations for schools included starting careers advice at primary school, better guidance for teenagers - including guaranteed face-to-face advice from experts - and the linking of every school to at least one university. The careers service in England is being changed and critics have said there is a danger some secondary school pupils will only have access to online guidance. Schools' achievements on careers advice should be tracked by Ofsted, said Mr Hughes. As for universities, he said many had made "great efforts" to widen access in recent years but the "huge progress of many" had been balanced "by the disappointing progress of some of the most academic and prestigious universities in the land". He said universities should do more to encourage people from poorer backgrounds in to medicine, dentistry, veterinary science and architecture. There was a danger that the length of such courses - and the costs involved - could deter poorer applicants, he said, leaving such professions to the children of people already in them - or "those who do not have to worry about money". Mr Hughes called for stronger powers for the watchdog on university access - Offa (the Office for Fair Access) - which can take action against universities which do not do enough to attract students from poorer backgrounds. He said although Offa was able to impose a fine of £500,000, there was a "get-out" clause for universities which should be closed by a change in the law. University groups have largely welcomed the report, especially the drive to reach children at a younger age. Universities UK says institutions have been working hard to widen participation and "in some cases are already making progress on areas recommended by the report". Groups representing teachers and students said the government was putting up barriers to higher education by increasing tuition fees, scrapping the Education Maintenance Allowance paid to poorer teenagers and cutting services such as careers advice and the Aim Higher university outreach programme. "It's hard to see that a report at this stage will have a real impact on the life chances of young people, which is such a pity - this should have been done before these decisions were made," said Sally Hunt of the University and College Union. Liam Burns, president of the National Union of Students, said the report was "warm-worded but toothless" at the end of a year "which has seen access to education curtailed". It will now be up to the government, as well as universities and schools, to decide whether to act on Mr Hughes's recommendations. Universities Minister David Willetts said: "Education is key to transforming lives, delivering social mobility and securing our nation's future. So we agree with Simon that young people must be supported in making well-informed decisions on university entrance, apprenticeships and other opportunities."